The CFP for Queer Conversations 2015 is now public. 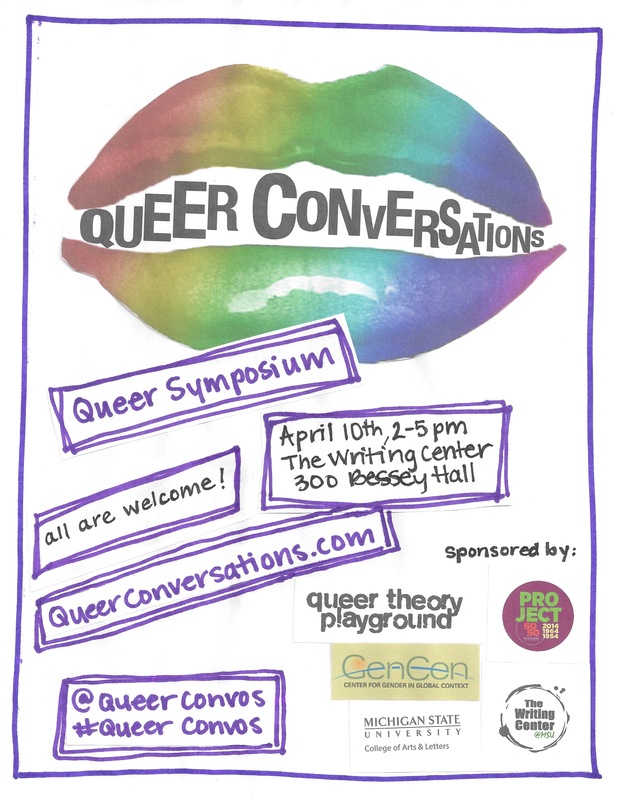 Join us on April 14th for a half-day symposium of conversation and collaboration on queer issues and research. We are seeking queer work from graduate students across disciplines and departments. Please share widely! Posted on January 27, 2015 by msucasey | Comments Off on Queer Conversations 2015 Planning Has Begun! We are eager to announce that Queer Theory Playground is in the planning stages of Queer Conversations 2015. Stay tuned for more information, including the CFP and news about featured performances! Comments Off on Queer Conversations 2015 Planning Has Begun! Comments Off on Queer Conversations Flyer! Posted on March 8, 2014 by msucasey | Comments Off on New Queer Conversations Website! Welcome to the Queer Conversations website! On this site you’ll find our CFP (proposals due March 12th), links to our co-sponsors, queer resources, and a space for post-symposium materials. The queer resources page has links to MSU resources, as well as a growing list of queer conferences across the country. And we’re very excited to offer a space for your conversations, a place to share post-symposium materials, from slides to videos to websites. There are just four more days to submit your proposals. And, of course, please join us on April 10th, 2-5pm to see the amazing queer work going on across disciplines and departments at Michigan State! Comments Off on New Queer Conversations Website! Comments Off on We Have a Logo!